Les tendances dominantes sont le déficit de naissance chez les francophones, l’étalement urbain et l’arrivée d’une proportion importante d’immigrants non francophones. Or, il est très difficile de faire bouger ces tendances. […] Contrer l’étalement urbain? Pas évident d’aller à l’encontre du choix personnel d’un nombre croissant de familles qui vont s’établir en banlieue. Is suburban sprawl really a personal choice? I would say that it is in reality a lack of choice — it is what has been made available on the market by speculators and developers, to the exclusion of all else. It is also the result of provincial policy decisions that favour automobile use over investment in public transit (highway 30), municipal policy decisions that delay or sideline walkable, transit-centric, denser urban neighborhoods with good portions of affordable housing. It is also the result of banks, private and public investment groups putting all their eggs into the production-homebuilding industry. Maybe people have been sold on the idea of suburbia as the dream where you have all the lebensraum you need, but when you think about it, suburbia is a lifestyle choice that has been politically wedged into our society, that drains the main economic engine (Montreal) of money in order to sustain itself. If it continues, Montreal’s critical infrastructure will continue to degrade, but ultimately, if Montreal goes, so go the suburbs that depend upon it vampirically. Emily Post was born Emily Price, the daughter of architect Bruce Price, who designed the Windsor, Viger and Chateau Frontenac station-hotels for the Canadian Pacific Railway, as well as the Royal Victoria College in Montreal. Mrs. Post herself dabbled in development, collaborating with Kenneth Murchison, an architect from her father’s firm, to build a 14-storey co-op apartment building for herself and her friends to live in. 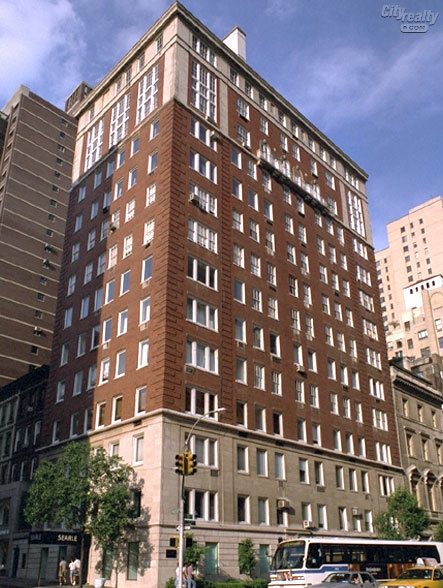 A well-proportioned NYC Beaux-Arts mid-rise tower, it exemplifies the “good guest” rule. It is neither loud, nor overbearing, nor a bore. It follows the host’s dress code, complementing its neighbours’ style, while possessing a quiet charm and beauty of its own. Many of the best buildings in any city are like this; not showpiece sculptures to be set upon a dais, but elegant ‘background buildings’ that represent variations on a theme. For example, Paris, like many older European cities, has a very uniform architectural texture — perhaps too uniform for some — but it’s a courteous, generous public realm that many cities still strive to emulate. In this context, overbearing ‘skyscraper farm’ developments wedged into low or medium-rise neighborhoods are like a gang of football hooligans intimidating your dinner guests. ‘Starchitecture’ showpieces, which uniformly ignore their neighbors in favour of eccentric, egocentric flashiness, are like those people who insist on coming to a formal event dressed in fluorescent pink Spandex, drink all the champagne, climb on top of the piano and start singing showtunes off-key. We have endured for too long the prevailing lack of courtesy within the public realm and the time has come to reinvent “good manners” in the way we build. We should surely be asking whether it is a natural pre-requisite of “being modern” to display bad manners? Is it “being modern”, for instance, to vandalize the few remaining relatively unspoilt, beautiful areas of our cities, any more than it would be “modern” to mug defenceless elderly people? Can it not be modern “to do to others as you would have them do to you?” That’s the question. Paris is an enviable place to live. It has parks galore. Its tallest residential buildings have six floors. The price of real estate does not exclude the middle class. Public transit serves residents superbly. And if my many cousins who live there are any indication, it’s great for families. Dense development, in short, can be fully compatible with a high quality of life. But it takes good, foresighted planning. Such planning is alien to our political establishment. The Communauté métropolitaine de Montréal, the regional planning body that Mayor Gerald Tremblay heads, is an ostrich when it comes to climate change. The Quebec government is worse: It keeps lavishly subsidizing sprawldom’s new highways, waste-treatment plants, schools, hospitals and other institutions, making a move to the 450 financially enticing. American blogger Atrios often returns to this topic, pointing out how simple changes in infrastructure land-use planning creates healthier cities that, he emphasizes, don’t necessarily all have to look like Manhattan. Montreal definitely needs to break the cycle of urban flight if it is to regain its tax base and fund the infrastructure improvements it needs. The municipal mergers were an attempt to get back that lost revenue, but that battle was lost to suburbanites’ demand that everyone else continue to subsidize their lifestyle. Projet Griffintown and the reported seven other development schemes waiting in the wings are attempts to create density on underused land, and in that respect it is a laudable goal. What we need, however, are not car-dependent suburban shopping centres gussied up as faux-downtowns, but extensions of the existing urban pattern. If it were morally unacceptable for the better-off to revive devalued city property and live in it, then where should they be allowed to live? A process of elimination left either a) the neighborhoods already occupied, b) the suburbs, or c) the rural hinterlands. Under this logic, the number of middle-class city dwellers would be forever fixed at the current level. And as studies such as Lance Freeman’s and Jacob Vigdor’s have shown, gentrification counter-intuitively stabilizes neighborhood populations; People of low to moderate income actually have an incentive to stay in their improved neighborhoods. Montreal has advantages that Paris does not, as Aubin points out — nearly five times the space, for instance — so there is more opportunity to create denser development affordable by all. It’s a planning challenge, but one that we will have to face sooner rather than later, if we are to meet carbon-emissions targets and ensure a functioning city well into the 21st century. Canada Lands Corporation recently launched its vision for Les Bassins, a development intended to replace the Canada Post Sorting plant at 1500 Ottawa. A detailed model showed a grouping of large, classically Bauhaus-modern, medium-rise condo buildings with a handful of taller towers. It was stressed that the final designs would be up to private developers, but no doubt this is what they’re seeking to get approved. The project centers around the now-lost historic working docks, i.e. basins, that existed at this point on the canal. The sorting plant would be ‘dismantled and recycled,’ not simply demolished, and the land decontaminated. A lot of space was given to mentioning inspirational eco-friendly projects such as Victoria’s Dockside Green and the Swedish Hammarby and Malmo BO-01 developments. Canada Lands proposed masterplan for the Canada Post site. 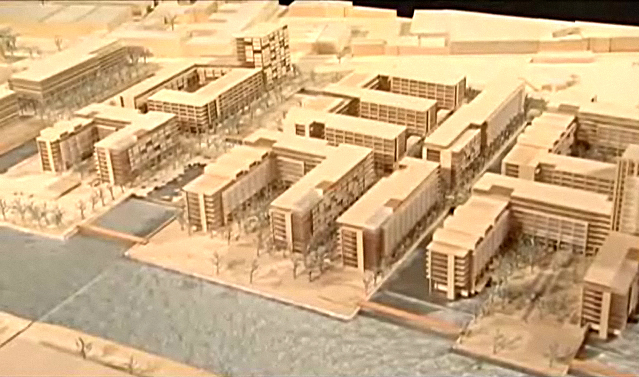 Model of sample buildings, Les Bassins project. All in all, very interesting, with laudable components — but as a neighborhood, it fails in many respects. Read on for the why. I’ve got a post in the works examining the proposed Les Bassins development — should be going up Monday or earlier. In the meantime, ponder these statistics from the Environment and Forecasting Institute in Heidelberg, Germany. Whether your car is a gas-guzzler, a hybrid or battery-powered, there’s a huge amount of pollution created in its manufacture and disposal, besides tailpipe emissions. From “Oeko-bilanz eines autolebens,” Umwelt-und Prognose-Institut Heidelberg. John Whitelegg, head of Lancaster University’s Geography department, also quotes this report’s findings in terms of deforestation, land use patterns, death tolls, water and soil pollution, and other effects that are externalized costs. The realities of geology and physics, and the urgent need to halt climate change, basically mean that the Individual Happy Motoring Era is over. Cars and trucks may not disappear completely, but we’re likely not to own or use them in such massive numbers as we do today. On a side note, many people scoff and say ‘we’ll go back to horses and buggies.’ So I asked my mom, a Sir George Williams U. History graduate who currently works at the Dorval Museum of Local History & Heritage, if people actually owned horses to the same degree that we own cars today ; apparently, no, they didn’t.